Have you ever read the ingredient label on a carton of nut milk from your local supermarket or health food store? Most of them are full of thickeners, coloring agents and sugars. 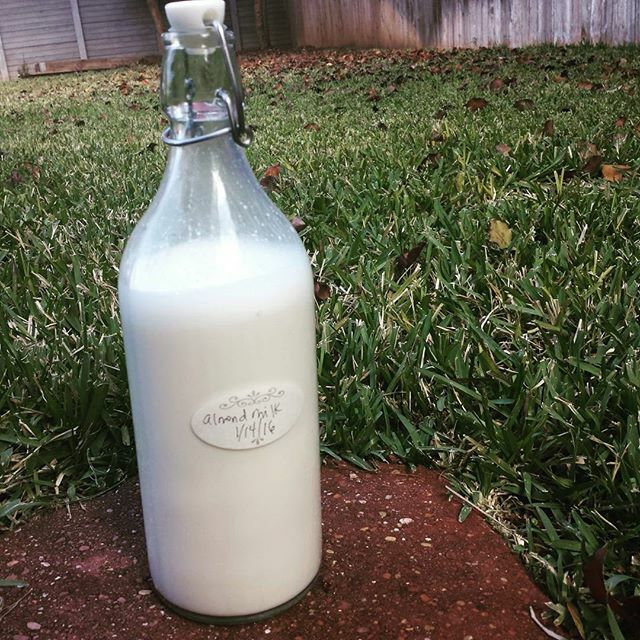 It’s kind of crazy because nut milk is so easy to make! You don’t even need a recipe, really, but here are the instructions for one quart of homemade nut milk. For all nut milks: begin by soaking one cup of nuts in water with a pinch of sea salt for 10-12 hours (or overnight). Rinse and drain nuts and dump into a blender with a pinch of sea salt. You also can add a pitted date and/or a bit of pure vanilla extract if you like. For almond or hazelnut milk: add 4 cups filtered water and blend on high speed until liquefied. This might take a couple of minutes depending on how powerful your blender happens to be. Line a wire mesh strainer with fine cheesecloth (or use a nut milk bag) and strain, then transfer the liquid to a sealed quart-sized bottle or jar and keep in the refrigerator for up to one week. That’s really all there is to it! If you’re making almond or hazelnut milk, you can take the further step of drying the leftover pulp in the oven or a food dehydrator, then pulsing it for a couple of seconds in a food processor to make nut meal for recipes that call for that ingredient. All for the cost of one cup of raw nuts! My friend Kim is basically a superhero. A talented journalist and blogger, mum to four boys and spectacular cook, the food photos she posts on social media never fail to get my mouth watering. A couple of weeks ago she posted a photo that had me wiping drool off my phone screen: jewel-like cubes of pork belly slow-simmered in Asian seasonings until they were sticky and caramelized. 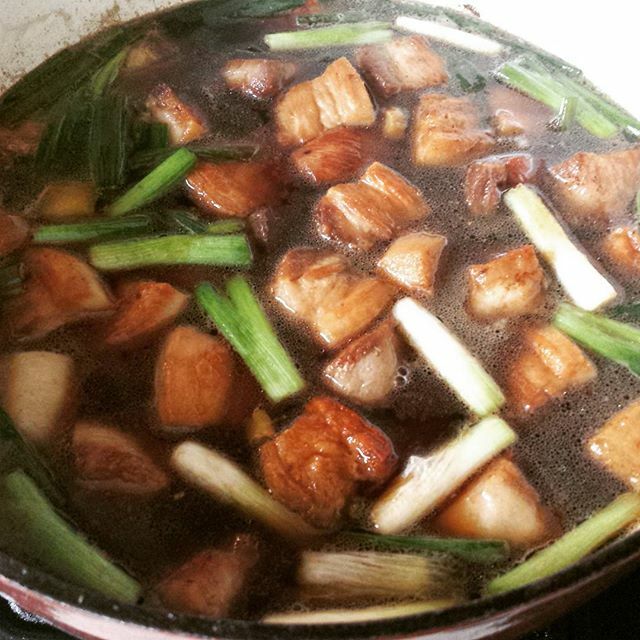 She called it Dongpo Pork and posted the recipe on her blog not long after. I had four pounds of pork belly in my freezer just waiting to be turned into such a delicacy, but there was one small problem: the original recipe is very soy-heavy, and my husband and kids all are allergic to soy. Other problems, on the night I decided I HAD TO MAKE THIS THING RIGHT NOW and didn’t want to take the time to run out to the store first: I had no idea what Shaoxing wine was, I had no peanut oil in the house, ditto Chinese tea of any kind, tritto yellow rock sugar (or any “normal” sugar for that matter). But no matter! When pork belly needs to happen, PORK BELLY NEEDS TO HAPPEN, PEOPLE. Somehow, miraculously, I managed to make it work with a million substitutions. Below is my hacked version of Kim’s amazing original recipe. For what it’s worth, my version is soy-free, nut-free and completely paleo, though I did serve it over rice. And it was delicious! We literally fought over the leftovers, which never happens in my house. Awesome stuff! Place the pork in a large pot or dutch oven, cover with cold water, bring to a simmer and cook for 10 minutes. Remove pork and set aside until cool enough to handle. Cut pork into 1.5-inch cubes (more or less). Wipe out the dutch oven, add the olive oil and brown the pork in batches over medium-high heat, setting aside afterward. Carefully wipe out the dutch oven again. Add the coconut aminos, molasses, mirin, coconut sugar and tea and bring to a boil. Add the ginger and onions. Add the pork and enough water to cover, if needed. Bring it back up to a boil, then lower the heat and simmer uncovered for around 3 hours or until the pork is tender (make sure all the pork is covered with liquid during the cooking process or, as per Kim, it may dry out). Remove the pork with a slotted spoon and set aside. Bring the sauce back to a gentle boil and reduce to a thick glaze (this took about 30 minutes for me). Pour glaze over pork and serve with rice, cauliflower rice, vegetable noodles or just on its own! This nourishing soup is perfect during cold and flu season! Mince or grate a bit of ginger and garlic into a big soup bowl. Peel carrot and zucchini with a vegetable peeler, then keep on peeling long ribbons from each one and put them in the bowl. These are your “noodles”. Add chicken, then sprinkle on some coconut aminos. Heat broth to a full boil either on stovetop or in microwave (just be very careful with the latter). Pour broth over vegetables and seasonings in bowl. Dunk all the veggies and meat under the broth and let them steep/cook for a minute or two. Top with fresh cilantro, a squeeze of lime and as much sriracha as your guts can handle. 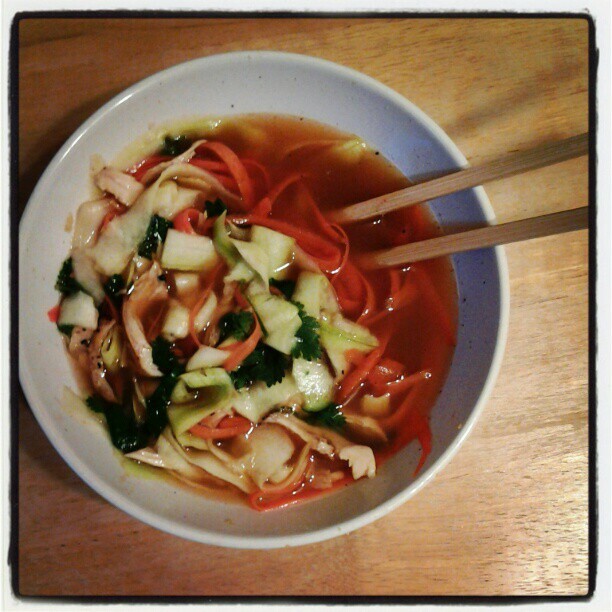 Slurp up with chopsticks. Serves one.